“I decided to start yoga because coping skills are an essential part of self-care as well as self-regulation, two of the many skills I enforce to the children on a daily basis. Yoga is a fabulous coping skill that benefits the “whole person” – which are one’s emotions, social, physical, spiritual, and cognitions. 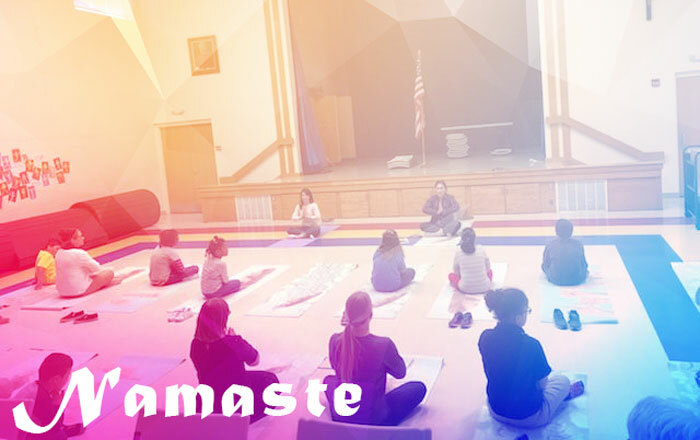 Here are just a few of the many ways yoga will benefit the children and adults at John Paul II Center. In today’s world, we hear so much about being the best and achieving the most. Yoga teaches kids that their bodies are different; different bodies do different things and all of them are okay. There is no one better or worse at yoga than anyone else; we are all just exploring our bodies and learning from them in our own way. Yoga is truly for every body. In the same way that it provides children an opportunity to learn something that is non-competitive, it also teaches kids to accept and cherish themselves as they are. Again, with society sending so many messages of inadequacy, yoga teaches kids to love themselves. Learned young, this incredibly valuable lesson arms kids with the tools to fight off the increasing feelings of self-doubt that come during the teen years and beyond. Namaste: The light in me sees the light in you. Yoga teaches acceptance and tolerance of others. In practicing yoga, kids learn early in life that all living beings are to be cherished and respected as they are, thus helping to create more peaceful local communities and a more peaceful world in our future. We live in a world of distractions. More and more these days, kids seem unable to focus on anything for any decent length of time. Yoga can help with that. It teaches kids to be present, and to concentrate and focus on their breathing. They learn how the breath can help them throughout the day, in any situation. They learn to focus on the pose by learning correct body alignment, and in so doing, learn to focus on their bodies and how they function—guiding each limb or part of the body through the nuances of the pose. Young kids deal with frustration most typically by crying and throwing tantrums. When they learn proper, healthy breathing techniques and tools to focus the mind, they begin to learn how to apply those tools in their everyday lives and to react appropriately to any situation. I know as an adult, I see improvements in this area in myself. Just imagine if I head learned more of these techniques as a child! Children learn self-awareness through yoga. Again, in guiding their bodies through the poses, children learn more about their bodies and what they are capable of. They learn more about their minds, and how they can affect not only their own attitudes and approaches to life, but also the attitudes of others. They learn that they can achieve this through their own thoughts and how they choose to react to any given situation. This awareness of the body, mind and spirit, and of what can be achieved when all three work together, helps children develop into more confident, kind, responsible adults. Yoga supports positive mental health in children. All of the above benefits tie together. When children learn to accept and love themselves for who they are, to see the good in others, to focus and calm their minds, and to be aware of their innate capabilities, they learn tools for resilience. They are more likely to be positive and optimistic about life and their abilities, and will hopefully be less likely to succumb to anxiety, depression and other mental health issues that are so prevalent today. Maybe most importantly, yoga teaches children that relaxation is not only allowed; it is encouraged. Relaxing is not easy and learning to relax takes practice. Yoga provides space for the mind to slow down and settle. Children are always told that they need to be engaged and productive. Their little minds are leaping from one activity to another all day long, often right up until they crash at bedtime. Yoga teaches kids that it doesn’t have to always be like that. If children can learn how to relax and be still, they will be able to handle better the stressors and pressures that will begin to hit them as they get older. For more information on Yoga and its benefits, you can visit the source for this article at DoYouYoga.